Aiming to counteract what they call "fabricated news" by Western media sources, pro-Assad activists hacked the Twitter feed of Agence France-Presse on Tuesday and flooded it with propaganda. AFP's @AFPphoto account was compromised by supporters of Syrian President Bashar al-Assad at around 16:45 GM on Tuesday and was hit by tweets and photo tweets constantly for around an hour, until the account was temporarily suspended. The Syrian Electronic Army, well known for their attacks on Al-Jazeera Mobile and Sky News Arabia, have claimed responsibility for this cyber-attack. According to deputy global news editor for AFP, Pierre Celerier, the photos that were posted during the attack are not AFP images. He says that they are allegedly images of Iraqi journalists killed in Syria and the site of a car bombing. The cyber-attack lasted approximately an hour, during which the hackers accused President Obama of supporting the use of child soldiers in the Syrian rebel army, including a photo tweet which allegedly shows a child beheading government prisoners. 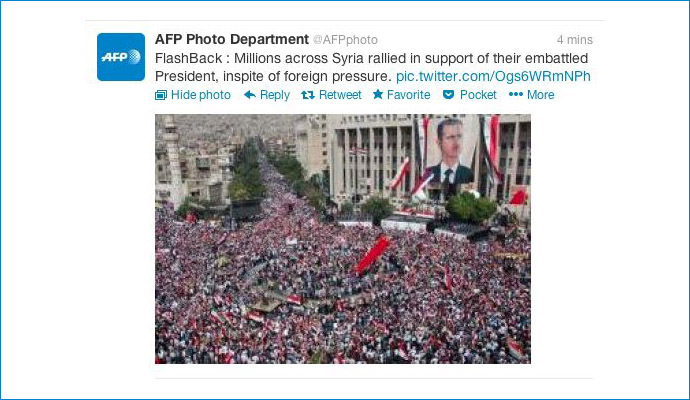 AFP's Twitter photo feed was hacked by pro-Assad supporters - fair use. Another showed a crowd of pro-Assad supporters with the words, "FlashBack: Millions across Syria rallied in support of their embattled President inspite [sic] of foreign pressure. 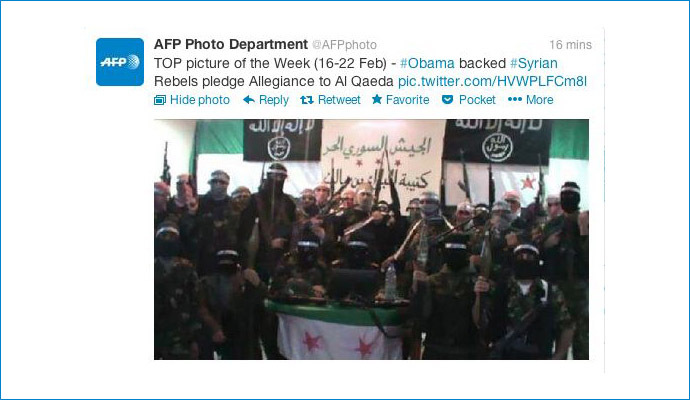 twitter.com/AFPphoto/.."
"TOP picture of the Week (16-22 Feb) - #Obama backed #Syrian Rebels pledge Allegiance to Al Qaeda pic.twitter.com/HVWPLFCm81"
AFP confirmed on Monday that they had also been the victim of a "phishing" attack which attempted to steal employees' identities by trying to force them to log in to a fake AFP website. Is is unclear whether the two incidents are related. AFP's Twitter photo account hacked http://bit.ly/128IzkB"
It appears our @AFPphoto Twitter account has been hacked. Recent photos posted are NOT ours. Unable to delete but working on it." AFP's Twitter account @AFPPHOTO was pirated today at 17h45 Any documents or images posted on this account after 17:45 are NOT from AFP."